[13:29:10] peper03: And the volume id only has a chance of working if you're playing directly from a disc. [13:31:35] peper03: They play ok but they don't have any disc id and I wanted to see what files they have. [13:32:58] peper03: libbluray only added support for UDF images recently. [13:37:27] peper03: ISOs over storage groups would be *much* more efficient than a file system. There are so many files on blurays and the myth protocol isn't very efficient in that respect. [13:40:53] peper03: If we try to make a unique ID by reading one or more files directly (as we do for DVDs), that also means we have to recognise and handle ISOs. [13:53:21] peper03: Still needs some tidying up and it's obviously missing the unique identifier stuff but the "state" saving and restoring works in principle (only tested it with hard-coded values but it works). [14:04:51] peper03: Absolutely. That was just my starting point. [14:46:48] Tobbe5178: how do the unit tests work? [16:18:28] JohnBergqvist: when i view info on that specific program, the category is: "Film" and the type is: "Unknown (94714981)"
[16:19:59] dekarl: oh, looks like we need to fixup the in mythfilldatabase so genre "Film" gets translated as "type_movie"
[16:25:39] dekarl: got to tend the kids, bbl. So its working again? [16:31:18] JohnBergqvist: although if i was to change the language to "English", then it will bork because as far as that's concerned, "Film" isn't a valid category, so it will flag them up as "Unknown"
[16:36:11] JohnBergqvist: Actually, it fixes the legend for all languages, but not the program boxes. [16:37:42] dekarl: ahh, maybe try progamming.css from master? [16:41:49] JohnBergqvist: Of course it doesn't help that some programmes are flagged as "type_movie" (which is correct) yet have their category not set to "Film" but the actual genre of the film, like "Comedy"
[16:42:32] JohnBergqvist: personally I'd have it so that if it's a film, it's got like a little icon in the top right of the block, similar to the HD logo. [16:45:15] JohnBergqvist: so are you saying that's what you're doing in the web frontend? [16:46:35] JohnBergqvist: have you kept the same categories & colours from mythweb? [16:47:40] JohnBergqvist: personally I think the whole categories listing should be totally rejigged & resorted, because some of the matchings are bizzare. [16:47:49] JohnBergqvist: The mythfrontend colours are dependant on the theme if i recall correctly. [16:49:03] JohnBergqvist: It doesn't help that the PA data for atlas is so inconsistent. Plus the atlas grabber grabs the program genres in a random order each time, the 1st of which Myth uses. [17:10:12] JohnBergqvist: Would there be problems further down the line if I altered mythfilldatabase so that it DIDN'T translate all XMLTV genres to lower-case when importing guide data? [17:16:58] JohnBergqvist: so could that be rationale for me submitting a change to disable that lower-case conversion? Or would you just reject it? 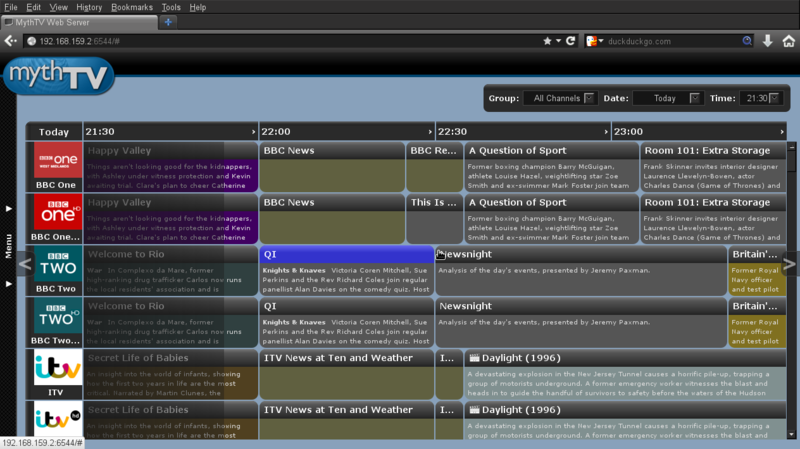 [17:58:44] JohnBergqvist: Also, where are the genre colours for the Frontend EPG stored? [18:46:35] tgm4883: JohnBergqvist: are you making a theme? [18:58:20] tgm4883: How can I further debug "*** stack smashing detected ***: /usr/bin/mythfrontend.real terminated"
[19:41:30] natanojl: could it be a version mismatch between the headers and the library? [19:42:08] jpabq: tgm4883: Writing a new theme is a major undertaking. I am impressed with your dedication. [19:44:51] jpabq: tgm4883: Tobbe5178: Maybe I should do a survey for Steppes, too. Although I definately do not have time to do a complete re-write. [20:39:12] JohnBergqvist: thing is though, wouldn't it be a bad idea to use a template based around the PA data, for other international grabbers too? [20:40:10] JohnBergqvist: I mean it wouldn't alter the actual genres that are in the database, just what colours mythweb maps them too & groups them into on the legend. [20:56:08] dekarl: https://metabroadcast.com/blog/g-is-for-genres suggests that there may be a concept of links between genres "is a narrower variant of" also "is a broader variant of"
[21:22:07] JohnBergqvist: Also the Atlas mapping puts science & nature shows into seperate categories, whereas I don't, but that's just personal preference. I don't see why News & Current affairs should be seperate myself. [21:42:17] JohnBergqvist: huh? how dyu mean? [21:42:53] JohnBergqvist: quite possibly. Although it's years since i've used the RT feed as it's depreciated now, right? [21:43:03] JohnBergqvist: they haven't added new channels to it since 2012 or something like that. [21:43:27] JohnBergqvist: in my one, i've used "Entertainment" as sort of a generic genre tbh. [21:43:46] JohnBergqvist: i.e. if it's not comedy, drama, documentary or sport. [21:44:00] jya: so did I break any of the buildbot? [21:49:13] jya: is it okay to add a new dependency with the plugin on libmythtv? [21:49:56] jya: every single time I add a new class, comes the hassle on finding out where to put it. [22:04:12] jya: BTW, I made the new AVPictureDeinterlace works in a similar fashion as the old avpicture_deinterlace. You feed it a single frame. [22:05:00] jya: the quality of the deinterlacing would be slightly greater. [22:05:35] jya: i compared avpicture_deinterlace result vs yadif single frames, and while there are heaps of difference, it's very hard to tell. [22:06:56] jya: can we agree not to make any changes that would bump the schema version for now ? [22:09:25] jya: are you planning to do a schema update in fixes/0.28 later? [22:17:09] jya: tgm4883: what does that do? [22:20:47] dekarl: snappy? the internet of things ubuntu? [22:25:28] jya: stuartm: can you test mheg following ffmpeg 3.0 resync?